Japan killed 122 pregnant minke whales in their last hunting expedition, according to a report to the International Whaling Commission. A report sent to the International Whaling Commission (IWC) revealed that Japan killed 122 pregnant minke whales in its last hunting expedition, in which it captured a total of 333 cetaceans. 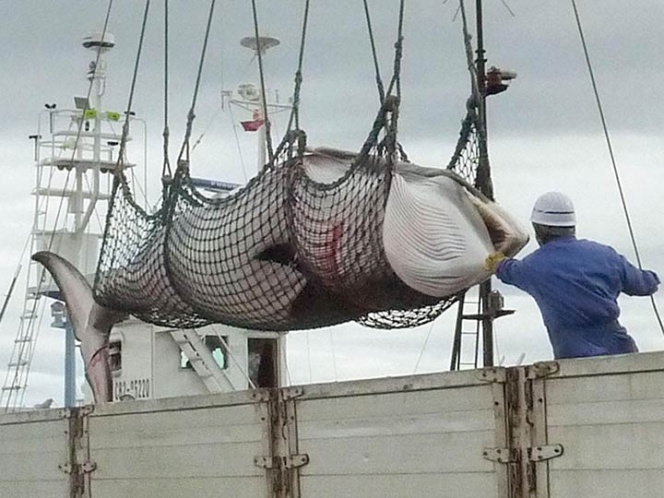 The Japanese hunting team left for Antarctica in November 2017 and returned to port last March with 333 minke whales, as part of their “field investigations” in that region, despite a 2014 ruling by the Organization of the United Nations (UN) against those missions. In a research plan published after the UN ruling, Japan argued that it was “scientifically imperative” to understand the Antarctic ecosystem by collecting and analyzing animals. In a report to the IWC, the New Scientific Program for the Investigation of Whales in the Antarctic Ocean detailed that of the 333 minkes captured during its “biological field study”, 152 were males and 181 females, also specified that 122 of these were pregnant. In the document, reproduced by the British BBC, the Japanese program indicated that 61 of the males and 53 of the females were not yet adults, but he recalled that he reduced the number of his captures and limited himself to hunting around 330 each year. According to Article VIII of the International Convention for the Regulation of Whaling, signed in 1946, countries can “kill, take and treat whales for scientific research purposes”, and this is the rule to which Japan sticks to continue your hunting expeditions. In addition, the Japanese government says that whaling is an old part of the culture of Japan since communities in the prefectures of Chiba and Ishinomaki have carried out this practice for a long time, just as they do in the prefecture of Wakayama with the dolphins. However, expeditions to the Antarctic for whale meat began only after World War II, when the devastated country depended on whales as its main source of meat, and although the sale continues, it is becoming less popular. Norway and Iceland still hunt whales for their meat, while in countries like Greenland, the United States, St. Vincent and the Grenadines, and Russia, subsistence hunting for local communities persists. However, Japan is the only one that sends ships to Antarctica to capture them.